Do you remember how Porsche tagged one of their cars with the names of each one of their one million fans on Facebook? Well, the airline KLM is pulling a similar stunt now and I love it. 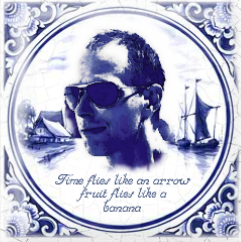 With the Facebook application Tile Yourself (http://apps.facebook.com/tileyourself/) you can create a digital tile in the style of traditional Dutch Delft wall tiles by uploading a photo of yourself or any other image. You can also add a quote to the tile. Some of these tiles are then chosen and will be painted on a real KLM plane. Here’s my contribution (“Time flies like an arrow, fruit flies like a banana” is a quote by Groucho Marx).